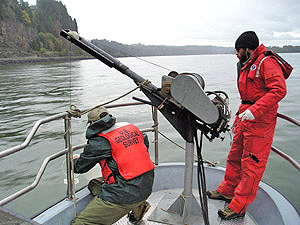 USGS scientists collected water quality samples at several locations along the Columbia River Estuary during 2004-05, from near its most upstream end below Bonneville Dam to near the mouth of the river at the Pacific Ocean. Data from the sampling will provide baseline information needed by State and local agencies in efforts to protect and enhance the health of the estuary. None of the aquatic-life or human-health benchmarks based on the U.S. Environmental Protection Agency water-quality standards were exceeded in either the Columbia or Willamette Rivers at sampling sites in this study. It is important to note, however, that the majority of compounds measured in this study do not have standards established. Just because a compound is not addressed by a standard does not mean that its presence or measured concentrations are not of concern. Although concentrations of arsenic, chromium, copper, and lead were not present at levels of concern with regards to aquatic-life toxicity, sublethal effects and signs of endocrine disruption have been linked to low levels of these compounds. While chromium was only detected in the Willamette River, arsenic was found at higher concentrations in the Columbia River than in the Willamette River. The median copper concentration from each of the three monthly sampling sites was 1.0 microgram per liter, a level shown to have inhibitory effects on juvenile coho salmon. Concentrations of trace elements in the Columbia River near Point Adams were elevated when compared to concentrations further upstream in the main stem and the Willamette River. Of the 173 pesticides and degradation products analyzed, 29 were detected at least once, oftentimes with 2 or more compounds occurring in a sample together. Fourteen compounds were detected in the Columbia River, 25 in the Willamette River. The triazine herbicides atrazine and simazine were the most frequently detected pesticides, most often in the Willamette River. Eight of the 54 wastewater compounds analyzed were detected at least once, usually at trace levels. The known endocrine disruptor, bisphenol A, was detected in both the Columbia and Willamette Rivers, while the suspected endocrine disruptor, tri(2-chloroethyl)phosphate, was detected only in the Willamette River. Of the 24 pharmaceuticals analyzed, acetaminophen, a common analgesic, and diphenhydramine, a widely used antihistamine, were detected in the Columbia River. Three of the 49 antibiotics and degradation products analyzed were detected. Anhydroerythromycin, a degradation product of the antibiotic erythromycin, and trimethoprim, an antibiotic used both for people and in aquaculture, were detected at most sites during low-flow conditions, but at only one site during high-flow conditions. Even though organochlorine compounds on suspended sediment were monitored monthly at the Beaver Army Terminal site from May 2004 to April 2005, p,p’-DDT was detected only once in October 2004 at 0.02 micrograms per gram. No other organochlorine compounds were detected. During the seasonal samplings of suspended sediment at all four sites, no organochlorine compounds or PAHs were detected. Of the 11 PBDE congeners analyzed, all were detected on suspended sediment, usually in trace amounts. The only quantifiable concentrations were measured near Point Adams. Of the 209 PCB congeners analyzed, 102 were detected at some time on suspended sediment at the four sites, usually in trace amounts. A third of these detections were quantifiable at the Willamette River during the high-flow sampling. There were fewer PCB detections during the low-flow sampling than during the high-flow sampling. Document Accessibility: Adobe Systems Incorporated has information about PDFs and the visually impaired. This information provides tools to help make PDF files accessible. These tools convert Adobe PDF documents into HTML or ASCII text, which then can be read by screen-reading programs that synthesize text as audible speech. In addition, a version of Adobe Reader that contains support for screen readers is available. The conversion tools and the accessible reader may be obtained free from Adobe through their conversion tools Web site. For information on ordering Oregon Water Science Center publications, click on this link. To learn more about USGS activities in Oregon, please visit our home page.